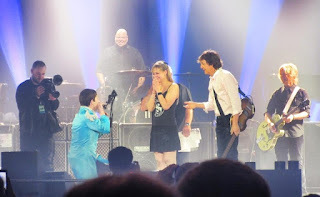 Diane McEvoy and Fabrice Gueho, who are both huge Beatles fans, were invited on stage by Paul in front of a full house towards the end of the show. Fabrice held a sign throughout the concert saying ‘all my loving I will give to her if you let me propose on stage tonight!’ and it worked. Paul McCartney asked one of his team to bring them to the side of the stage for the encore and the next minute they were stood with him. Both overwhelmed whilst on stage, Fabrice giggled uncontrollably as his girlfriend Diane looked on in sheer amazement. Once he managed to get the words out and ask for Diane’s hand in marriage, she of course said yes! Diane McEvoy, 31, from Versailles in France, moved to Liverpool to follow her passion for The Beatles and now has her dream job at the Beatles Story. Her and fiancé, Fabrice are both huge Beatles fans. On the proposal, Diane, who works on admissions at the Beatles Story, said: “I was so overwhelmed when a security guard came over and asked us to follow him to the side of the stage. I thought I might faint and was just shaking. Myself and Fabrice had always said it would be amazing if we could do something like this and I knew about the sign of course, but we never thought it would work and I had no idea he had the beautiful ring with him. Diane and Fabrice celebrated after the concert at the Cavern Club on Mathew Street.